And now I'm going to follow up and answer all of your questions as they rolled in! Keep this in mind though: I'm not a hair care professional. I did not attend cosmetology school, nor am I a colorist, cosmetic chemist, stylist, apprentice, or anything of the sort. I'm a blogger that talks to these kinds of people regularly for information + does a little independent research on the side. I can't be held liable for whatever happens to your hair as a result of this article. As with all things complex in hair care, I will always advise you to see a professional. @xhelloyellowx: How do you dye without ruining your curl pattern? My best pre-dye advice is to make sure your hair is in tip-top shape. Make sure it's not breaking or shedding excessively, that you've got split ends under control, and don't have major moisture retention or porosity issues. If you're suffering with any of the above, permanent hair dye will do nothing but exacerbate the issue. As far as getting the color done the DIY vs. professional route, I'm always going to side with encouraging you to see a professional to get the color done properly. I've gone both routes, and the result was 137% better when I saw a professional. If you have previously colored hair, definitely see a professional. Trusting your dye job to a professional that understands textured hair will ensure that you leave the salon with your curl pattern very much in tact. Maintaining that curl pattern after the fact is a whole 'nother animal. If you're not careful, your curls will start to loosen and become lackluster. pH balancing, protein-heavy conditioners and super moisturizing products are a must. I'm working on a top 10 must-have for colored hair post, but definitely look into Roux and ApHogee (click each for review). @611clayton1012: Is this color called berry red? 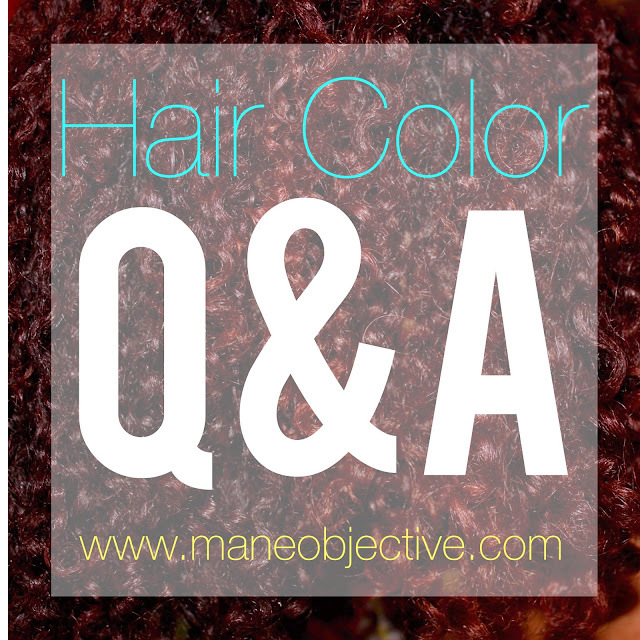 @msbaretta: Are temporary hair dyes damaging to the hair? I want to change my color but am a commitment phobe. I'm thinking about trying something that can wash out over time. Any suggestions? There's tons of options for temporary dye that don't damage the hair. The first is the semi-permanent dye (aka cellophane), and the other options are things like sprays, hair chalks, eyeshadow, and color creams (like Manic Panic). The worst side effect of any of these temporary color changers is dryness to the hair, or having the color flake and rub off on your clothes. Those effects normally occur with the chalks, eyeshadows, and sprays. Using a semi-permanent dye shouldn't cause those issues -- mainly because it just deposits color and lightly conditions the hair (like a gloss), and comes out over the course of 4+ washes. The only trade-off with semi-permanent color is that it doesn't really show on top of dark hair. To see a little more boldness, experimenting with the sprays and chalks may be the way to go. 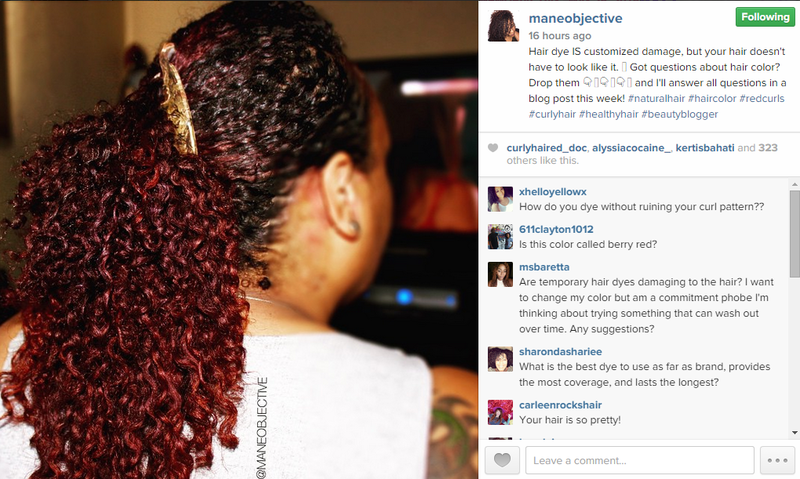 @sharondashariee: What is the best dye to use as far as brand, provides the most coverage, and lasts the longest? That is a phenomenal question, and really difficult to answer. Each stylist or colorist will give you a different answer based on preference and experience. My best advice in this area is to speak with a colorist who deals specifically with textured hair. @kayelaine: What changes in your regimen helped you hold on to moisture post color? Lawwwwwwd I can write a whole post on this topic alone! I've had to totally revamp my regimen post-color. I'm going to do a post with the top 10 products I use to shape my colored curl regimen, but let me just put this out there: every product I use has to have at least two of these qualities: silicone, super hydrating, tons of slip, protein-rich, pH balancing. I'm not kidding either. But seriously, your regimen has to do darn near a 180 to make sure that the hair stays on your head. @aintnannotha: 1. Rinse vs. Semi Permanent? 2. Hemp vs. Regular Color? 3. What kind of damages occur and how to recoup? Thinking About Hair Dye? Weigh the Pros and Cons First. @chantelleyd: Same. Rinse vs. Semi Permananet vs. Color. I want to color my hair but not sure which is best after finally getting my hair officially rid of all the relaxed ends! Hey girl! The dissertation answer I just gave @aintnannotha definitely applies here :) I can't tell you what to do with your hair (you know I'm team #doyouboo), but in my humble little opinion, after transitioning out damaged hair (and the struggle that comes with it), I'd be super hesitant to do anything that has the potential to drastically alter my curl pattern. Now, if you're all about that "it's hair, whatevs" life, then go for it! But if you want to revel and bask in your newly 100% natural hair, go for something non-damaging, like a semi-permanent. Of course the lack of vibrant color is a trade-off for tresses that will stay healthy. Be sure to keep us posted on what you decide! @chanellehans: Hi!!! I just need some tips on treating my psoriasis please. Thanks!!! @greeneyedboricua: You're my Hair Crush it looks fabulous. I'm 4 months post my "Big Chop". Should I continue to steer clear of all chemicals so they don't hinder the health and growth of my hair? @reignofdiamond: Is henna less damaging to the hair? @curlyhaired_doc: Is Demi damaging? I did a Semi red a few weeks ago but now I want black. Also, how soon is too soon if I want to do the Demi black? Demi-permanent dye is different from semi-permanent in that it does require a low-level developer to gently lift the cuticle and deposit color. It doesn't contain ammonia and therefore does not strip the hair. How damaging it will be totally depends on the health of your hair overall. I would definitely consult with a professional first, but since semi-permanent only coats the outside of the hair, you're probably good to go after a few washes. And also, look into a good purple (yes, purple) shampoo and conditioner for blonde hair. Purple poos and conditioners help keep your blonde hair from turning awkward, brassy colors. Thank you guys so much for your questions! This was fun! I think I may do more topic-related Q&A posts in the future -- let me know in the comments what topics you guys think I should open the floor to!